What would you do if you were confronted by a bear? Joseph Gledhill gave it a biscuit. The biscuit hawker had just watched as a huge bear made its athletic escape from a wishing well-sized pit at a zoological garden in Yorkshire. Mr Gledhill calmly handed the animal some of his wares and went for help. That was back in 1844, when keeping bears in pits had moved on from the now banned bear-baiting and on to zoological study. The early bear-baiting pits were temporary structures - used once and then forgotten - but these new, permanent holes in the ground were sturdier. However they were not sturdy enough to hold the bear that was kept at the Orangery in Wakefield. It jumped and pulled itself over the ledge, going on to kill a woman and badly injuring another before being shot dead. It's a tale that is being retold by artist Rebecca Chesney as part of a project for the Orangery. "They had bought the bear three years before from a chap in Leeds so the poor thing had been in there for a long time," said Ms Chesney. "The bear got out just a couple of weeks before the woman was killed and there are reports of them having to raise the sides of the wall." 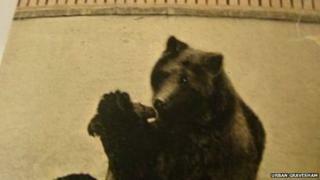 Hannah Haselgrave, the garden owner's sister-in-law, was killed by the bear as she tried to usher it back into the pit. The biscuit hawker, Mr Gledhill, told an inquest into her death that the bear was "leaping about in the pit, leaped and got a hold of the top of the pit and pulled itself up and got out", according to newspaper reports from the time. Mr Gledhill said he gave it one of his biscuits before alerting the gardener's wife and sister-in-law. The pair attempted to recapture the animal but were both attacked by it, with 53-year-old Hannah Haselgrave suffering fatal injuries that saw major arteries in her left arm and thigh "destroyed". The bear went on the run around the Orangery's Zoological Gardens before being shot and killed. How much longer the bear pit stayed in the gardens of the Orangery Ms Chesney isn't sure, but the site became a graveyard before being turned into the function building of today. Visitors now will find no sign of the bear pit and according to English Heritage, there are very few still standing. "Bear pits were often temporary and few early examples have been recorded," said a spokeswoman. "Although there are a few listed bear pits, and parts of several animal-baiting arenas have been located by excavation close to the Rose and Globe theatres in London's Bankside, so far no examples have been scheduled." One that does remain is the bear pit in Cardigan Road, Leeds. It is all that is left of the Leeds Zoological and Botanical Gardens and was created for members of the public to view bears, rather than for baiting. The public viewed the bears from the tops of the turrets, one of which has a spiral staircase. The pits became popular in England in the Victorian-era as interest in exotic animals grew and crowds flocked to see something new. The novelty gradually wore off and the pits began to be emptied, a fate that befell bears at Sheffield Botanical Gardens. The pit there still stands and once housed two bears, probably until the late 1850s. So unusual is it, English Heritage granted the pit listed status. It was the home of Bruin the black bear in 1836, whose sole entertainment was a tree placed in the middle of the pit for him to climb, according to research by local historian Alison Hunter. Sadly for Bruin, he didn't much like climbing and wasn't very popular as a result. The local newspaper the Sheffield Mercury called him a "disappointment", adding that he was "exceedingly loath to climb, and in what effort he did make, his admirers thought him indolent, unapt, and unwieldy". By 1839, newspaper reports were complaining of the "filth" and "stench" of the bears and in 1856, it was suggested at a meeting that they be replaced with a vinery. They were not mentioned in print again, although local rumour tells of a young boy who once fell in and was killed. However, garden curator Ian Turner said there was no proof the bears had ever killed anyone. "There have been third, fourth, fifth-hand reports but there is no evidence in newspapers," he said. The real reason Sheffield's bears disappeared may actually have been down to plain old indifference. People grew tired of animals that didn't entertain them and the exhibits were replaced by exotic gardens. "Most animal exhibits disappeared very quickly," said Mr Turner. "A second pair of bears was donated in the 1850s and probably they died or were moved on. "They wanted to focus on being a botanical garden and animals are noisy, smelly things so that was probably the reason they got rid of them." The pit was not the only one to be given listed status by English Heritage, with a pit in Rosherville Gardens at Gravesend, in Kent, also given listed status. English Heritage believes it probably dates from the 1830s and although currently buried, much of the structure, including its painted white door and slate floor, remains intact. A bear called Rosie was one of those housed in the pit. Sadly, she ended up being shot and eaten in the early 1900s after the gardens decided to get rid of her. According to local campaigners Urban Gravesham, who have been fighting to restore the bear pit and features of the Italian gardens as a small local park, a man bought Rosie intending on keeping her in a stables. When the man who ran the stables refused, saying the smell of a bear would spook his horses, three-year-old Rosie was shot. She was skinned and turned into a rug while her flesh was sold to the nearby Queen's Hotel where the chef turned her into dinner. "Rosherville Gardens closed in 1912 and reopened in 1913 with new management and the menagerie was gone," added Jonathan Clay of Urban Gravesham. The pleasure gardens closed that same year and were destroyed and filled in with chalk in 1939. The bear pit itself was dug up by archaeologists, granted listed status, then reburied, removing yet more evidence of the animals of England's bear pits.